I am a former General and Special Ed teacher, and have experience lecturing in Child Development. I am also mum to an autistic young adult, from whom I have learned so much about autism and sensory processing difficulties. 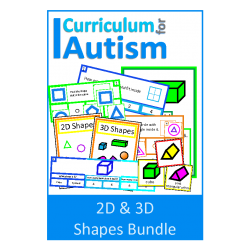 All the graphics used in my resources have been designed by to appeal to a wide age range, as I know how difficult it can be to find age appropriate resources for older autistic students. These graphics have been created by my older daughter. 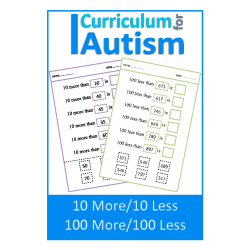 IEP Goals: Given up to six more than/less than problems to solve, STUDENT will write or cut and glue, the correct number response to show 10 more/10 less, 100 more/100 less, in order to solve the equation, with 80% accuracy, in 4 out of 5 opportunities, by MONTH, YEAR. 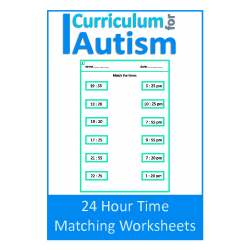 IEP Goals: Given two sets of times to compare or match (24 hour time clock/Military Time to A.M./P.M. 12 hour clock), STUDENT will match or draw a line to the matching set of converted times, as a means of demonstrating understanding of telling time with 80% accuracy, in 4 out of 5 opportunities, by MONTH, YEAR. 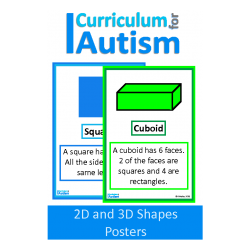 IEP Goals: Given a picture of a 2 or 3 dimensional shape and its' definition to use a reference guide, STUDENT will refer to the guide in order to define or solve a problem, with 80% accuracy, in 4 out of 5 opportunities, by MONTH, YEAR. 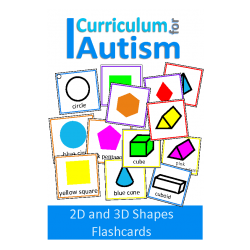 IEP Goals: Given 2-dimensional shapes and flashcards, STUDENT will match/sort/name with 80% accuracy, in 4 out of 5 opportunities, by MONTH, YEAR. 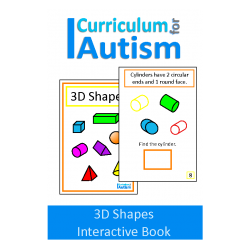 IEP Goals: Given a two-dimensional shape and an assortment of objects (pictures), STUDENT will choose the correct response card with 80% accuracy, by matching the same shape as seen in an object,in 4 out of 5 opportunities, by MONTH, YEAR. 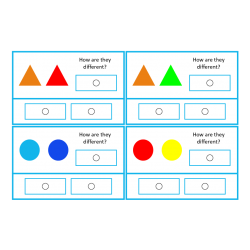 IEP Goals: Given two shapes with either the same or different attributes (color or shape), STUDENT will answer "What is the same?" and "What is different?" questions, by choosing the correct response card with 80% accuracy, in 4 out of 5 opportunities, by MONTH, YEAR. 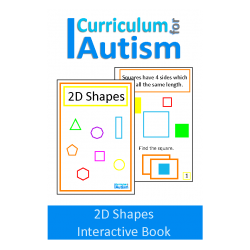 IEP Goals: Given a model of a specific shape, STUDENT will determine the shape, number of faces, and corners that the object has, by counting, drawing, or writing the responses, with 80% accuracy, in 4 out of 5 opportunities, by MONTH, YEAR. 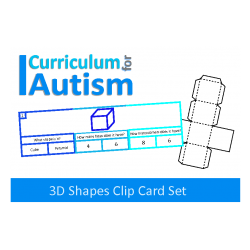 IEP Goals: Given a three-dimensional shape and an assortment of objects (pictures), STUDENT will choose the correct response card with 80% accuracy, by matching the same shape as seen in an object,in 4 out of 5 opportunities, by MONTH, YEAR. 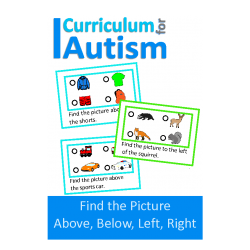 IEP Goals: Given a written direction to find and object that is above, below, to the left, or to the right, STUDENT will mark or point to the correct object, with 80% accuracy, in 4 out of 5 opportunities, by MONTH, YEAR. 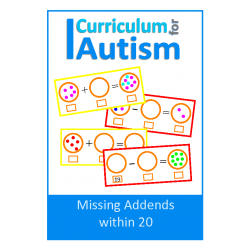 IEP Goals: Given one addend and the final sum, as represented in a picture with objects and numbers, STUDENT will determine the missing addend by counting on, in order to solve the problem, with 80% accuracy, in 4 out of 5 opportunities, by MONTH, YEAR. 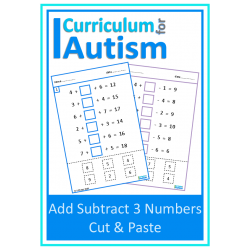 Given a number from which to subtract, and the difference as the last number in the problem, STUDENT will use pre-taught strategies to subtract, in order to solve the problem, with 80% accuracy, in 4 out of 5 opportunities, by MONTH, YEAR. 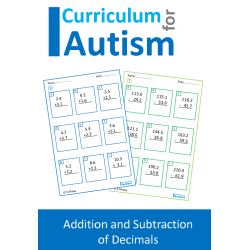 IEP Goals: Given a mixed worksheet containing decimal problems to add or subtract, STUDENT will determine the difference or sum with 80% accuracy, in 4 out of 5 opportunities, by MONTH, YEAR (IEP end date). 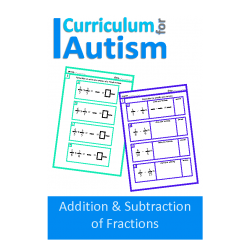 IEP Goals: Given up to ____(# of) problems to solve in which STUDENT is required to add or subtract fractions, STUDENT will simplify or write the mixed number with 80% accuracy, in 4 out of 5 opportunities, by MONTH, YEAR. 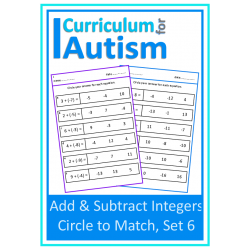 IEP Goals: Given a problem to solve by adding or subtracting, STUDENT will determine the integer with 80% accuracy, in 4 out of 5 opportunities, by MONTH, YEAR.